Visit some of the top destinations of Sri Lanka on this 2 Day trip from Colombo which is a perfect mix of adventure, culture and history. Visit the best preserved cave temple, Dambulla temple (also known as Golden temple). These caves are filled with religious paintings and sculptures. A 15m long sculpture of Buddha is the highlight of this place. The frescos on the walls and ceilings are from the 15th century and they depict scenes from the life of Buddha. Next we visit the Sigiriya Rock. Sigiriya also known as the 8th wonder of the world is one of the historic monuments in Sri Lanka. This ancient cliff top fort includes remains of a ruined palace and a still well maintained terrace garden. Originally designed to resemble a sitting lion, now the upper body structure is completely ruined. Next we go for a morning wildlife safari at Minneriya National Park. Get to see the famous largest gathering of Asian elephants on planet as they all come together on the banks of the water body in Minneriya Park. 1:00pm - Break for lunch at a local restaurant. Later you can explore the local arts by craftsmen at shops of the area. 2:30pm - Arrive in Sigiriya and climb the Sigiriya Rock Fortress which is known as one of the wonders of the world. 5:00am - You will be picked-up from your hotel situated in Habarana, Dambulla or Sigiriya. 5:30-10:00am - Enjoy Minneriya National Park by Jeep. There are numerous elephants in this park. Unlike in other national parks, elephants can be spotted at a relatively close range. This park has over 150 species of birds, about 9 types of amphibians and 25 varieties of reptiles. More than 75 butterfly species are found in this area. Park is also home to a rare bamboo trees not found in any other national park in Sri Lanka. 11:30am - We head towards Colombo. On way we stop for lunch at a restaurant. 5:00pm approx - Trip ends with drop at you Colombo hotel or address provided. Had a fantastic trip with Trodly. 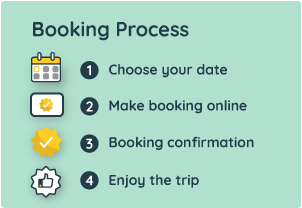 Booking it was super easy and got trip updates on time. Could not climb Sigiriya as I was tired but best part was Minneriya morning safari. Saw plenty of elephants and buffaloes.